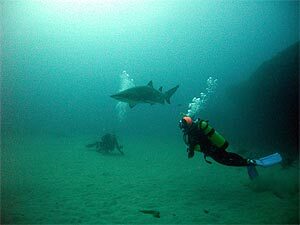 A shark up to 3 metres in length and known from a range of habitats. Grey Nurse sharks are pelagic and feed on a range of smaller fish such as Yellow-tail scud. 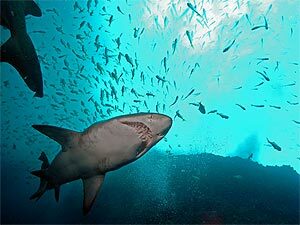 There are several defined aggregation areas such as South West Rocks and other sites used during the breeding season such as Foggy Cave off the NSW coast. They group together in coastal waters, normally at depths of between 60 and 190 m. Often they will shelter in caves or gutters during the day, and come out at night to feed. During the day they can be quite sluggish, becoming more active at the night. The grey nurse shark is the only shark known to gulp and store air in its stomach to maintain neutral buoyancy while swimming. It is a predator, eating bony fishes including mackerels, other sharks and rays, squids, crabs and lobsters. Although achieving a large size greynurse sharks have a very small gape and are not “man eaters”.